I had the tremendous pleasure Thursday night of seeing a preview of Disney's new cartoon feature (and I use those words lovingly and respectfully). 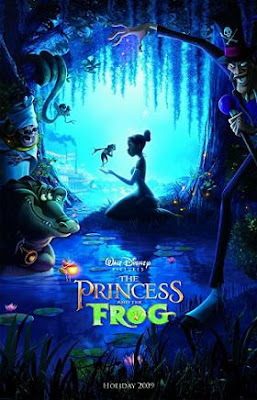 "THE PRINCESS AND THE FROG" is PHENOMENAL! It is everything Disney animation afficionados hoped for! The visuals are gorgeous and spectacular, the music is tremendous, and the storytelling is compelling - beautifully interplaying comedic, scary and heart-tugging elements with deft skill. 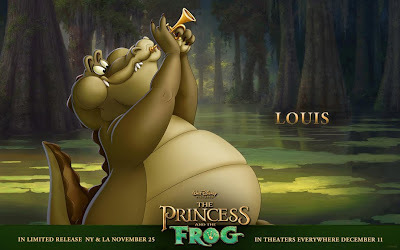 All the animation is brilliant, but in particular Eric Goldberg has outdone himself with his animation for "Louis," the trumpet-playing alligator! 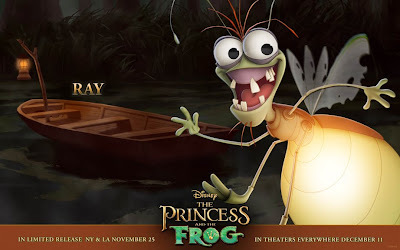 I also loved "Ray," the cajun firefly. Those of us who love traditional animation MUST support this effort with great enthusiasm. Plan a party, ask your friends to join you, and buy LOTS of tickets. I am hoping this will get the box office sales it deserves - and become a blockbuster. It's definitely got the Disney magic... and might just become an instant classic!